Paid users in the system are called as “Pro User”. Why should I prefer Alpemix? It is one of the best software which you can find with regards to the performance. It is a software which does not require installation, does not require the configuration of any settings. It is licensed as independent of the computer. You can use pro user right from any computer you want. Updates are made automatically. And you do not pay for the new versions. You can connect to limitless number of computers. You don’t pay for the computers you connect to. Although it has many advanced features, it’s a software which is very easy to use. It is the best solution with regards to the price. 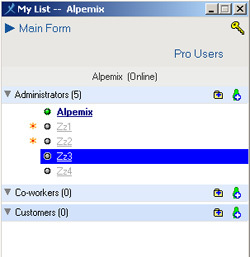 Many features such as “identification of your own users in a specific hierarchic structure and communication with them over the list, connection by a group password, blocking the communication with outside the company, sharing a specific part of the screen etc.” which you cannot find in any other software are present only in Alpemix. You can provide support for your customers in 4 different ways (defining a user name, with group password, with name surname and with id password). What is the difference of pro users from free users? How many users must be purchased? 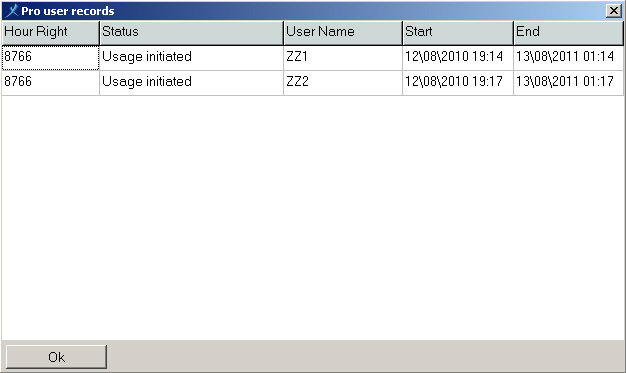 As the pro user is enabled for the user name, it can be used at any computer required. You can provide remote connection to unlimited number of PCs.You will not pay any fee for the computers you will provide remote connection. (Except for special case) Generally, the pro user rights should be purchased as many as the number of the people providing support at the same time on different computers. I have 4 workers providing support to customers in my company. I purchased 2 each 1 year Pro User rights. How will I use it? First of all you log in with your company user name by pressing on “Registered Log In”. 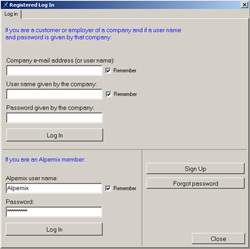 The user name is assumed as Alpemix in the sample. 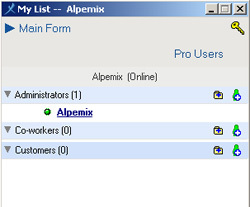 Due to being the main user log in is done from the “if you are the “Alpemix” member” section at the bottom side of the form. 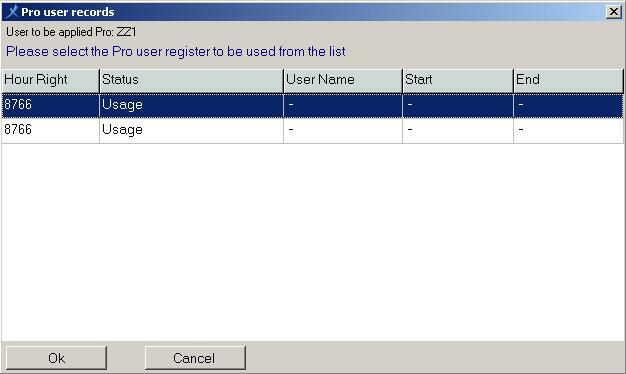 After log in, user list is appeared. When we click on ther “Pro Users” button at the right part on this screen, the form appears showing our pro user rights. As it is seen at the second image, we do not determined pro users yet. The 8766 hours on the image is 365 days and 6 hours. It means that we have 1 year usage right. We said that we have 4 authorized persons. Let’s create these 4 authorized users. 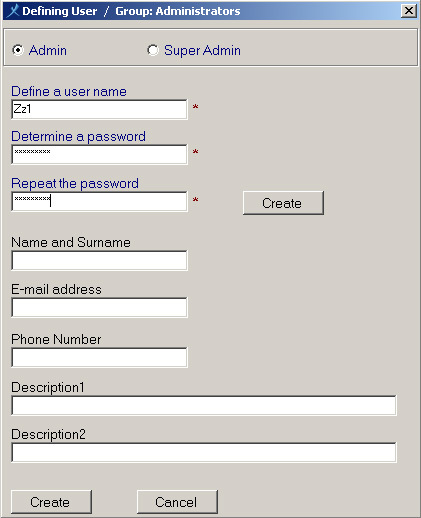 We click on the icon at the right of “Authorized persons” topic in the list form and the form shown in the image below appears. 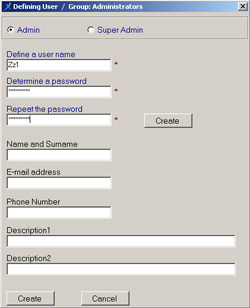 We determine user name and password from this form and click on “Create” button under the form. With the same method, we defined 4 authorized users as Zz1, Zz2, Zz3, Zz4. Now we will make 2 authorized users out of 4 as pro users. 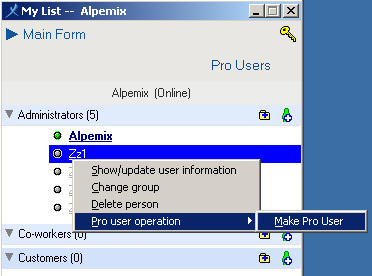 As it is seen on the image below, we right click on the user that will be pro user and select “Make Pro User” option. We have 2 Pro User rights, so the form appears showing which right will we use. Second image below. We complete the operation by clicking on “Save” button in this form. In the same way, right click on the second user and “Make Pro User” option is selected. Due to being used our first right, it will directly be pro user without seeing the form on the second image below. As it is seen on the first image below, “Zz1” and “Zz2” users became pro users. Now pres again on the “Pro Users” button on the right of list form. The form at the second image appears. We see that we can give pro user right to users and start / end dates of these rights from this screen. 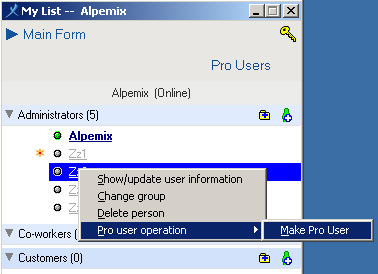 Now these users can use Alpemix program as Pro User by Logging In with the user name and password defined from any computer. With the same method, you can define your customers to “Customers” group and make your customers easily communicate with your authorized persons. When authorized persons want to establish a connection with a person not included in the customer list, they can establish communication with their ID and password by clicking on “Main Form” section located at the top of list form. 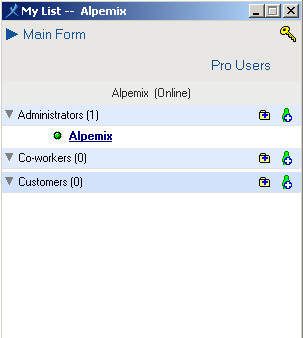 You can also add users to “Work Mates” group and use Alpemix easily for intercompany communication. You can cancel the pro user right given go Zz1 and give to Zz3 or you can give this right to a user you added to “Co-workers” group.